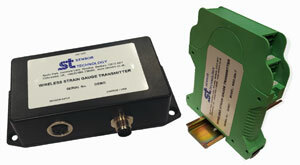 Sensor Technology Ltd.: Banbury-based Sensor Technology Ltd has a new range of transmitters that can add wireless capabilities to any make of strain gauge. The WSG series transmitters allow any manufacturer’s strain gauge to send readings to Sensor Technology’s wide range of displays and readouts, which can be located at a distance from the gauge itself. Alternatively, they can be used with Sensor Technology’s PC-based software so that, as well as direct read out, analysis and interpretation can be completed instantly. The transmitters are for use with 350 ohm strain gauges and above. Calibration data is set using simple interface software. The wireless signal transmission is based on the unrestricted 2.4GHz technology, so does not need an operating licence. In use because there is no need to install and protect long cable runs from the gauge to the readout, the WSG units create a versatile and easy to install system. This also makes it simple to move the equipment between installations if required. There are various models available within the range. The WSG-STD unit is DIN rail mountable and powered by a standard 11-32V DIN rail supply. The WSG-STM variant is designed for bench or wall mounting and has an internal rechargeable battery; it also has a socket so that it can also be powered from an external 11-32V supply. Both versions have a USB port for connection for a PC.